The Anna Maria Island Community Center NFL Flag Football season for kids kicked off with a bevy of teams competing in four age divisions at the center, 407 Magnolia Ave., Anna Maria. The 5-7 year olds are in a development program, in which no scores or standings are kept. Teams in the 8-10 division, 11-13 division and 14-17 division are working toward a spot in their respective season-ending Super Bowl competitions. 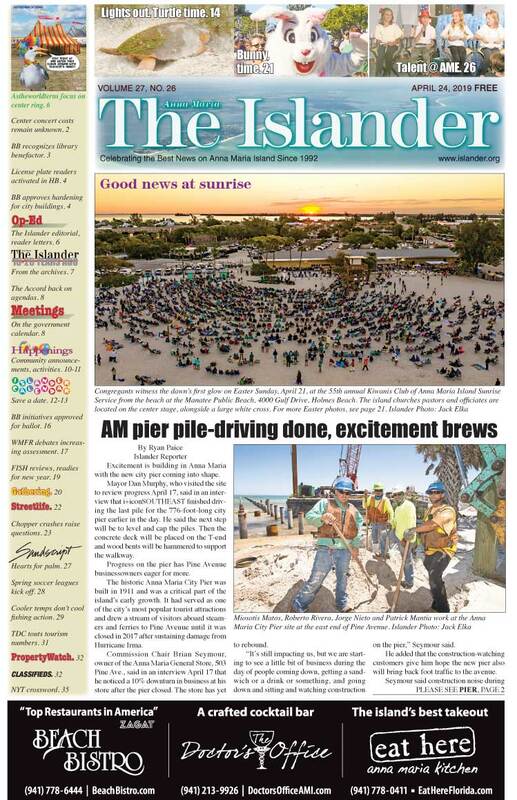 Each week, a game of the week in each age division is highlighted, and readers can follow the season in The Islander. The 8-10 division game of the week saw Coastal Orthopedic Bears edge Lobstahs Browns 27-21 Jan. 11 behind a huge day from Jackson Hayes. Hayes rushed for 73 yards and a touchdown, catching four passes for 116 yards, including three touchdowns and an extra point. Tuna McCracken passed for 155 yards and three touchdown passes. Two passes went to Gavin Johnston, who added a 2-point conversion, and Madelyn Rogers had one catch for 14 yards. Defensively the Bears were led by Hayes with four pulls and Adam Carlson, who finished with three pulls. McCracken finished with two pulls and an interception to close out the victory. Nathan Hyman paced the Browns with 154 passing yards and three touchdown passes. Two went to Morgan Horesh, who finished with six receptions for 56 yards, including an extra point and a 2-point conversion. Jack Barnes completed the scoring with one touchdown catch among his three receptions. Hyman, Horesh and Barnes each came up with interceptions to lead the Browns defensive effort in the loss. In other 8-10 division action, LPAC Cardinals defeated Air & Energy Jets 30-6 Jan. 11. Beach Bistro Buccaneers shut out Manatee Cancer Center Dolphins 6-0 Jan. 10 and Tyler’s Ice Cream Vikings slipped past Miller Electric Chargers 13-6 Jan. 8. The 11-13 division game of the week saw Lobstahs Buccaneers defeating Holy Cow Cardinals 34-22 behind 86 yards passing and three touchdown passes from Joe Rogers and 72 passing yards from Rutger Langley. Jean-Paul Russo also had a big game, catching seven passes for 92 yards and two touchdown receptions. He also ran for 82 yards and a touchdown, while Noah Heskin added three receptions for 13 yards and a touchdown in the victory. Russo and Langley led the Buccaneer defense with three pulls each, while Trevor Meek and Gavin Sentman each added one. Trent Boring ran for 70 yards and a touchdown, also catching a 3-yard touchdown pass to lead the Cardinals on offense. Tyler Pearson ran for 38 yards and a touchdown including a 2-point conversion. Pearson and Boring led the defensive effort with five pulls each with Pearson also adding an interception. Bathie Thiam finished with three flag pulls and an interception in the loss. West Coast Surf Shop Buccaneers edged the Walter & Associates Bears 33-32 in 14-17 division action Jan. 8. Quarterback Zach Stewart completed 17 of 22 passes for 185 yards and three touchdowns. Jack Shinn also had a big game, running for 61 yards, while also catching seven passes for 80 yards and a pair of touchdowns. Tony Sperduto added four catches for 28 yards and three touchdowns in the victory. Walter & Associates was led by Seth Walter, who completed 15 of 26 passes for 177 yards and five touchdowns. Joey Harris caught six passes for 83 yards and three touchdowns, while Jack Walter added six catches for 86 yards and a touchdown. Jake Rodgers rounded out the Walter scoring with one catch for 5 yards and a touchdown in the loss. Jack Walter led the defense with five flag pulls. In other 14-17 action Jan. 8, Integrity Sound Falcons flew past Eat Here Packers 49-14. Two teams emerged from pool play during Jan. 12 horseshoe action at the Anna Maria City Hall horseshoe pits. The team of Larry Livrago and John Johnson demolished Bruce Copeland and Rod Bussey 21-2 in the finals. Four teams advanced to the knock-out round during Jan. 9 horseshoe action. Bob Mason and John Johnson rolled past Jerry Disbrow and Tom Anderton 22-9, while Dom Livedoti and Rod Bussey slipped past Bob Lee and Tim Sofran 22-17 in the other semifinal. Mason-Johnson prevailed in the finals, winning 22-17 over Livedoti-Bussey. The men of Key Royale Club opened the New Year with a low-net-of-partners match Jan. 2. Three teams combined to card matching 10-under-par 54s to finish in a four-way tie for first place. Vince Mercadante and Dale, Hudson, Gary Harris and Jim Thorton, and Jim McVicar and Peter Thomassen shared clubhouse bragging rights for the day. On Jan. 3, the men played a nine-hole team scramble. The team of Jon Holcomb, Randy Clark, Kent Newbold and Mike Pritchett matched the 5-under-par total tallied by the team of Art MacMillen, Chaz MacMullen, Fred Miller and Larry Pippel.